The truth is a cow’s effect on global warming has everything to do with how it is raised. Cows and other livestock do put methane into the atmosphere, but when they are 100% grass fed and pasture raised in a rotational grazing system, the grassland ecosystem they are a part of sequesters more carbon in the soil than the methane they release. That’s a net positive effect on climate change! When my husband and I began searching for land to start Medicine Creek Farm, we knew we wanted soil health to be central to our mission of creating healthy food. For us, raising cattle, sheep, and pigs on pasture was not just the ethical and humane way of raising meat, but a profound way of both regenerating long-abused farm land and addressing climate change. Regenerative agriculture is an approach to food and farming that doesn’t just sustain itself, but actually improves and builds topsoil while enhancing biodiversity above and below the ground. Recent understanding of soil health has revealed the exceptionally important place of livestock in the ecosystem. What biologists have found is that grasses co-evolved with ruminants to respond positively to being grazed. The more the grasses are stimulated to grow, the more carbon they pull from the atmosphere through photosynthesis. This carbon, as well as the carbon in decomposing plant matter that is trampled into the soil by livestock, becomes organic matter in the soil that further feeds the microbial life there. Healthy soil, aided by livestock, becomes a carbon sink! The key to keeping the plant and soil healthy, however, is to not OVER-graze a pasture. The grasses must have enough leaf remaining after being grazed to not stunt its growth. There is an intricate balance to the system which nature kept in check with predators. Herds of ruminants were kept constantly on the move by predators following them through the grasslands so no one area became overgrazed. 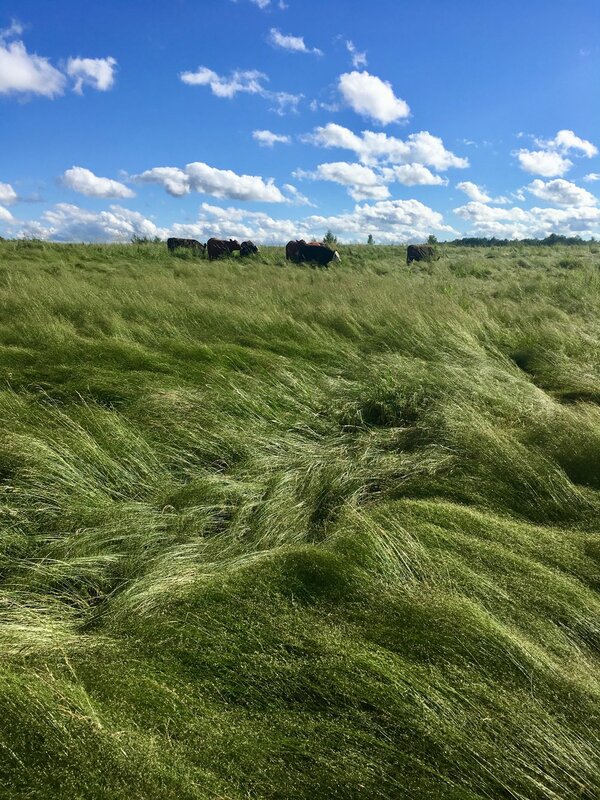 Rotational grazing systems were developed to mimic nature in this way. What this means for our day to day life as farmers is lots of time outside taking down and putting up temporary electronet fencing to make small subdivisions (which we call paddocks) within our larger fenced-in pastures. We move our animals to fresh grass almost every day in the summer. All of the animals are now trained to follow me when I call them as they know this means a tasty new bite of grass. It also means they associate me with something positive, which minimizes their stress when I do need to handle them, and allows me to interact with them up close on a regular basis so I know right away when there are any health issues. In the winter we get a little more rest from the work of daily paddock rotations through bale grazing. Before the ground freezes we create up to eight paddocks that will stay set up all winter, and slowly rotate through them so no one area is damaged by too much hoof action. We create a grid of hay bales within each one and open one bale at a time; instead of using bale feeders to minimize waste though, we allow them to dig in and make a mess! When the weather heats back up, we know this mess is just more carbon that will decompose and increase organic matter in the soil. After a season of recovery, we can visually see the positive results with bright green rings of tall healthy grass where the bales once sat. These methods of grazing are sometimes referred to as “management-intensive” since it requires quite a bit more labor than simply putting your livestock out to pasture and not checking on them again for weeks or even months! But many farmers who have adopted rotational grazing and regenerative agriculture, myself included, will argue that interacting with the land and animals in this intimate way every day is what makes farming pleasurable. And there is nothing more satisfying than knowing my human participation in this ecosystem is helping undo some of the climate damage our food system has created. When you eat grass fed meat, you participate in that ecosystem too.